We help payers and providers who are at various points on the continuum of moving to value-based care and payments. While a robust health IT network is the backbone of a successful model for patient-centered accountable care, our focus is on driving the functionality that is needed right now. We do so by delivering actionable information that drives the cost and quality goals of the organization directly to the individuals that need that information when they need it. Our strategy advisory and program management services are focused on helping payers and providers develop and execute a strategic plan for filling the critical gaps in the health IT infrastructure when coming together to contract for the delivery of value-based care. Our strategy and market intelligence services help emerging accountable care organizations and other collaborations re-focus their health IT investments to support value-based care. 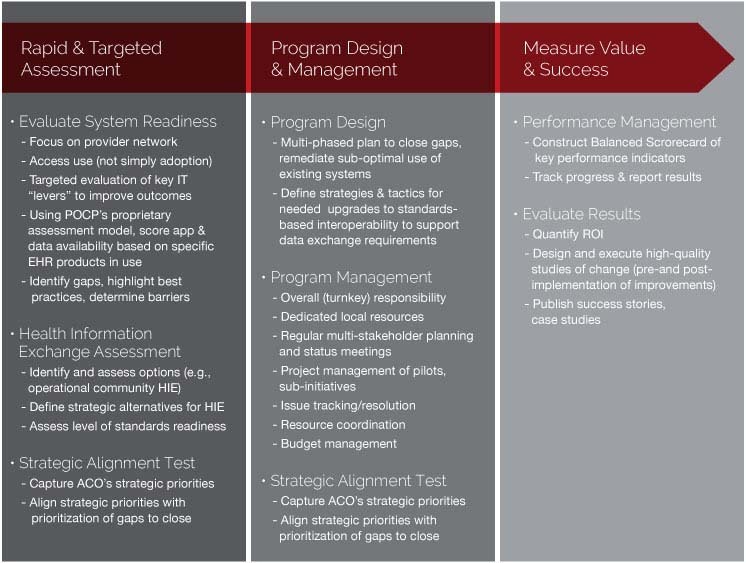 The central focus is on rapid and targeted assessment of the health IT infrastructure.